DeeToolMan has just released a quality-crafted, sturdy and reusable weatherproof door insulator that is easily and quickly applied to your door! Wave Sky-High Electricity Bills Goodbye! Made from top quality Styrofoam and deluxe fabric material, this ONE SIDED 36"L x 2.5"H x 1"W is to block gaps and cracks up to 1.3" under your doors! It is your weatherproof, dustproof, windproof and energy saving ally for the most efficient home improvement. Stop wasting your money on bulging heating bills and turn your home or office into a warm, cozy place, totally safe from freezing drafts of air, dust, insects and disturbing noises! Simply MEASURE the size you need, CLEAN the door bottom with a dry rag, APPLY and you are done! NON-SLIP and sturdy, the Velcro self-adhesive tape means your draught excluder will remain firmly put FOREVER unless you need to remove it! It can be put back easily; just instantly attach it to the Velcro strap that is firmly fixed to the door. It is a reliable REUSABLE product, made to save you money! 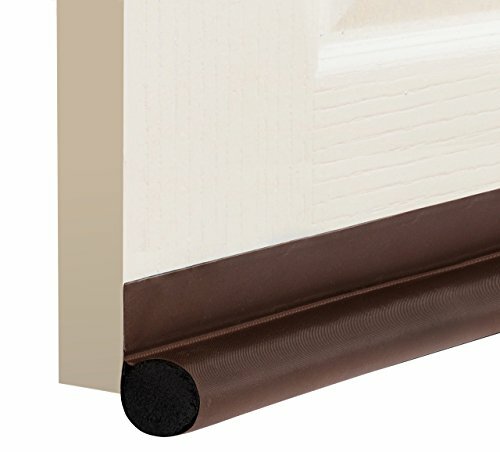 Get A Decorative Under Door Draft Stopper! The stylish, elegant design makes this door insulator perfect for complementing your home decoration. It is a modern and classy decorative product that will give a quality, minimalist look to your home, office or commercial store! Ideal for any type of door, it is a MUST-HAVE for next generation energy-efficient homes! Click Add To Cart NOW To Get Yours Today Risk-Free! ✔️ONE-SIDED UNDER DOOR DRAFT STOPPER! Fits door up to 36" and will close gaps of up to 1.3". Made from premium Styrofoam and luxury fabric. It's sturdy and durable enough to remain firmly fixed for long term use! ✔️SAVE MONEY AND ENERGY! Cold air stays out and heat stays in. Cool and heat you home more efficiently. It's also great for blocking out dust, sand, light and insects. To make your noise insulation ULTRA efficient, add draft blockers to BOTH sides of the door! ✔️USE ON ALL TYPES OF DOORS! Perfect for any type of door bottom such as glass, wood, plastic, aluminum alloy and bathroom doors. ✔️REMOVE & REUSE! Tired of door draft stoppers that slip? With the strong ADHESIVE BACKING and the VELCRO TAPE, It moves with the door. It can be easily removed to facilitate cleaning and is easy to put back in place. ✔️YOUR 100% SATISFACTION IS OUR TOP PRIORITY! This is why we back our door insulator with a 100% Money Back Guarantee and prompt, friendly Customer Service to address any issues you may have at any time. If you have any questions about this product by DeeToolMan, contact us by completing and submitting the form below. If you are looking for a specif part number, please include it with your message. Office Owl Office Chair Wheels by for Smart Home Offices, Set of 5 Heavy Duty 3" Replacement Rubber Office Chair Casters, Cool Rollerblade Style Chair Casters For Hardwood,No Need For Chair Mats.